But that is the nature of boutique cigars. If you can find one in every corner smoke shop, it ain’t boutique. The brand is owned by Enrique Sanchez Icaza of Global Premium cigars, and while distribution seems to be restricted to the Eastern U.S., the company entered into a distribution agreement with Emilio Cigars late last year, and that may improve availability. Precise data on this cigar is also hard to come by. 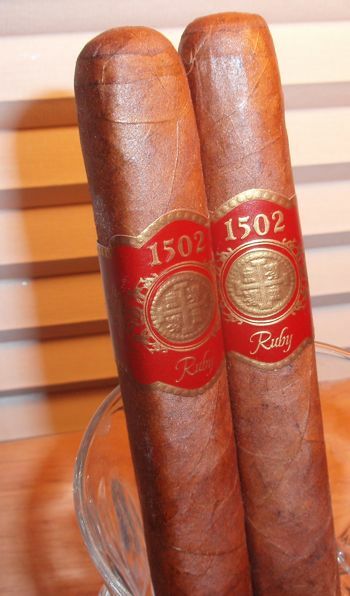 What is known is that there are three blends of 1502 — Emerald, the lightest of the bunch; Ruby, with an Ecuadorian wrapper; and Black Gold, the heaviest blend, with a sun-grown maduro wrapper. Three sizes appear to be made: Robusto, Toro, and Torpedo, though I don’t have measurements on those either. 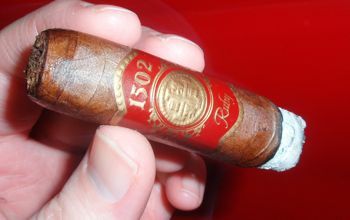 The 1502 Ruby Toro is a box pressed parejo with an attractive colorado maduro wrapper. There are some fine veins, but the wrapper is smooth and the roll is supple. There are a few small irregularities in the bunch, a couple of barely noticeable dents, but nothing that would turn up in a casual inspection. The cap is integrated well and shears away nicely. The Ruby burns very well, especially for a box pressed cigar, and the ash is firm. The draw is easy and the smoke volume generous. The Ruby Toro has all the characteristics of a good Nicaraguan cigar — there is some pepper up front and an acidic, mouth-watering quality that is typical of Nicaraguan tobacco. The aroma is sweet and woody. As the cigar develops, a fruity note rises up that is somewhat like cherry. To me it’s reminiscent of Tatuaje’s La Riqueza blend, which is surprising because La Riqueza uses a completely different kind of wrapper (Connecticut broadleaf). In the middle section of the cigar there are notes of coffee and cocoa and the spicier aspects of the cigar tone down a bit, only to return in the last third. The smoke is medium in body, and about medium in strength as well. The woody notes become earthier as the cigar winds down, but the cherry note in the aroma lingers. I frequently find that by the end of a cigar the palate flavors overwhelm the aroma, but the 1502 Ruby is really well balanced in that respect. The 1502 Ruby shows restraint and finesse, which is usually not Nicaragua’s strong suit. A lot of Nicaraguan cigars emphasize the explosive factor of that nation’s tobacco, and it often results in an unbalanced flavor spectrum and a shell-shocked palate. The Ruby showcases the classic Nicaraguan cigar flavors — wood, pepper, and citric acidity — in a less boisterous, but still flavorful way. And I especially like the cherry note in the aroma. It looks like the going price for these is in the $6 USD range, which is quite reasonable given the quality of the cigar. The only problem for me, as a denizen of the desert southwest, will be sourcing them locally. With any luck we’ll see wider distribution soon. I’ve read good things about the 1502 lines, but like you, getting hold of them will prove to be the difficult part in my area. Hopefully Gary will get these into wider distribution. I saw an interview with Enrique where he said that his goal is to produce a top-notch, yet affordable cigar, and that’s important to me. Yes, a lot of people say that, but it looks like he’s done it. With apologies to Pete, anything that brings to mind La Riqueza at a lower cost is a winner in my book. Thanks for another informative review!